Click on a coin to view additional values, details and varieties about it. PL (Proof-like): Special coins struck at the Mint with a brilliant relief is struck on a brilliant field and not intended for circulation despite the fact that their composition is identical to the coins produced for circulation. 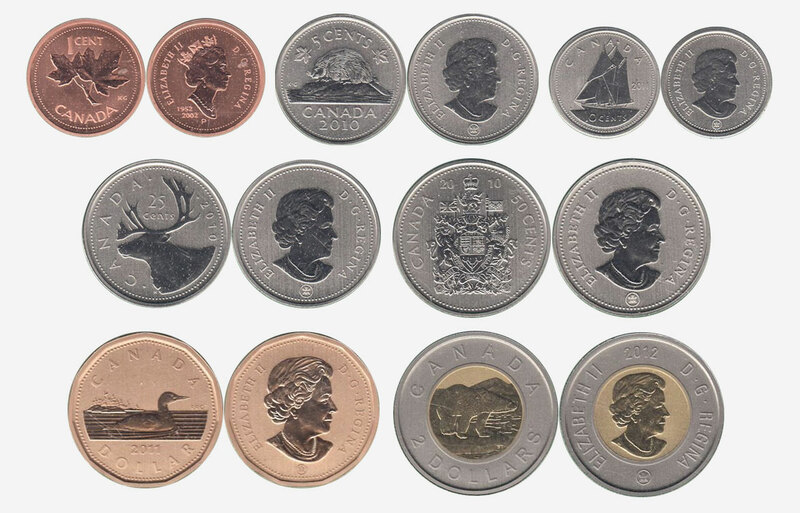 If Proof-like coins have been removed from their protective envelope or original package, it is harder to differentiate them from uncirculated coins. Proof-like coins are struck up to two times on numismatic presses. Also called Brilliant uncirculated (BUNC). SP (Specimen): Special collectors coins struck at the Mint with a frosted/mirror appearance on the design and effigy from 1996 to 2019. Before 1996, if specimen coins have been removed from their protective envelope or original package, it is harder to differentiate them from PL coins. Specimen coins are struck up to two times on numismatic presses. View the grading section to identify grades (AG-3, F-12, AU-50, MS, PL, SP).